A big brown bat getting a drink of water. As you can see, they need nice flat, open water sources. This spectacular image is from Vassar University. Hi everyone! I hope you all had a good week! As you know, it is Bat Appreciation Month. One way people can celebrate this spectacular month is by doing things that would attract bats to their yards. I found an article that explains how people can do it! One way you can attract some bats to your house is by building a bat house. Sadly if you live in Northern Virginia, this might not work for you. The bats that live around here don’t seem to like houses that people hang up for them. They would much rather find their own little homes. If you live somewhere else, or just want to give putting out a bat house a try, then it should be at least 15 feet above the ground. This will help protect bats from predators on the ground. You might also want to contact your local bat experts. They might be able to help you decide on what type of house to put out for the bats that live in your area. Another way you can attract bats to your yard is by planting a garden. It is better for the environment if you use plants that are native to your area. A nice garden will attract yummy bugs that bats like to eat. If you plant night-blooming plants, nocturnal insects, such as moths, should visit your yard and you will probably get more bats. Your garden should also attract animals that come out during the day like butterflies, birds, and other wildlife. Having a water source is also a very effective way to get bats to visit you. Catching bugs can be a lot of work, and they get tired. The cute little critters need water! Bats do not land when they drink, so they need a big area to fly and drink. 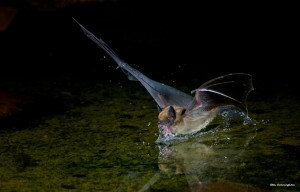 Sometimes bats drink out of swimming pools, but it isn’t very healthy for them. You can get a bird bath, or an artificial pond instead! The bats will be happy, and the bird bath might get birds too. If it’s a big enough pond you might even be able to have some fish in it! I hope everyone has a great week in a month dedicated to bats. Next Story#BatWeek #BatSquad #BatWeek #BatSquad! !